Knitting booties is one of the knitting project I really enjoy. 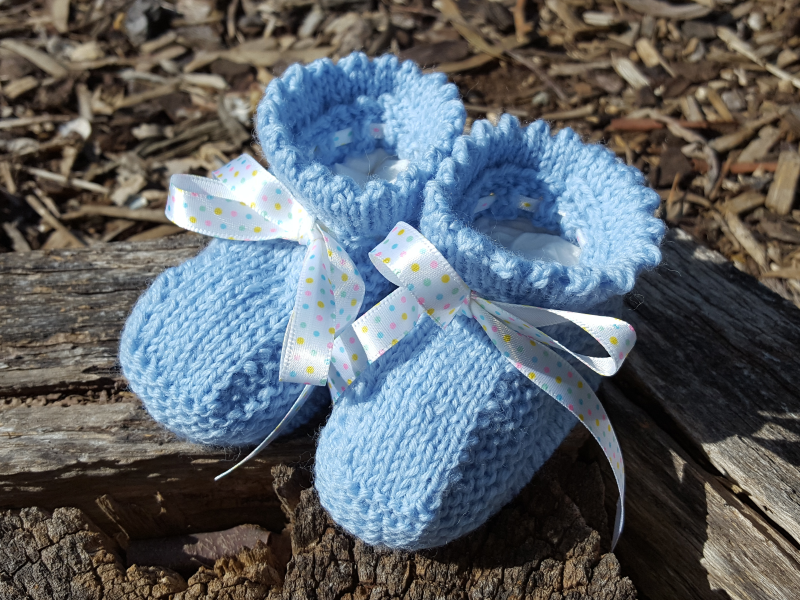 Although baby booties tend to have gone out of fashion with young mothers in favour of mass produced socks, knitting baby booties is still a very rewarding pastime and a hand knitted pair of baby booties makes a great baby shower gift. 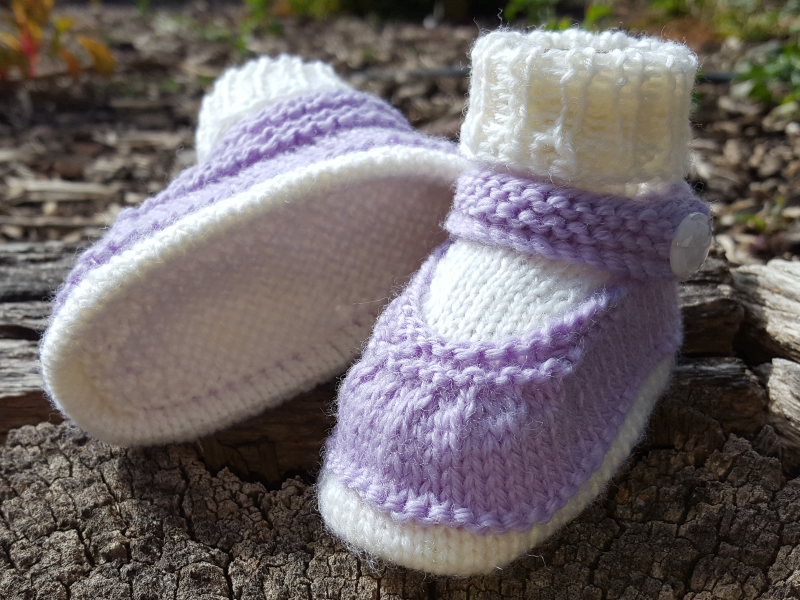 Baby booties are small (naturally) and even though there is usually some shaping involved they are still relatively easy to knit and it does not take very long to make a pair. 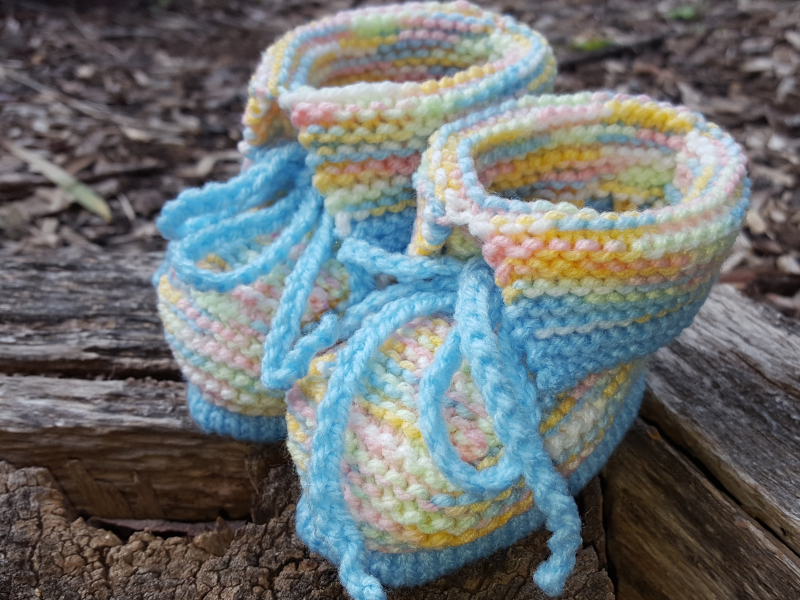 If you use a basic baby bootie knitting pattern, modifying the pattern to incorporate your own designs is a fun and practical way to exercise your creativity. 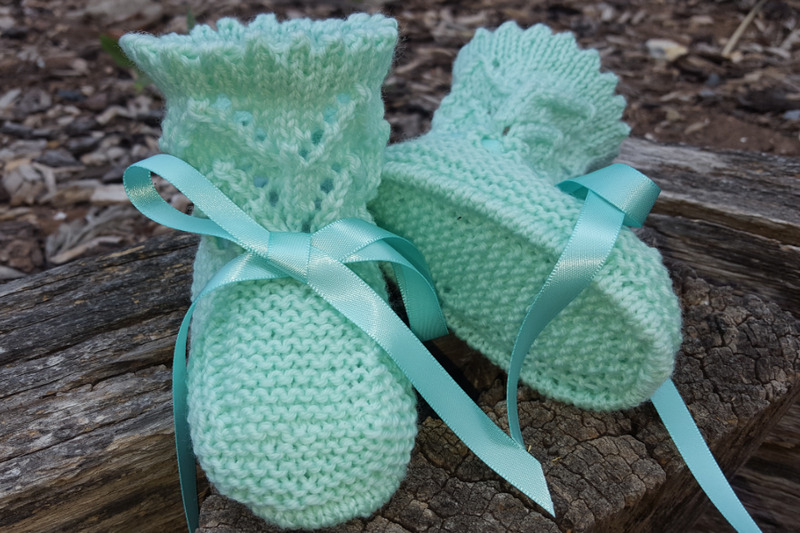 Of course, if you are making a matinee jacket or a pram set for that special baby in your life, baby booties are a must to complete the ensemble! Baby booties tend to be knitted using a fine yarn, either 2, 3, or 4 ply on small needles although some of my own designs use 8 ply and 2.75mm needles so that the bootie is more like a boot - they are thicker and more solid so they look more like boots or uggs than booties. Most bootie patterns will specify the age of the baby, 0-3 months, 3-6 months or 6-12 months which I find a little unhelpful really. I prefer sizing that tells me how big the booties are. My (more advance) patterns are sized according to the length of the sole. With this sizing scheme, if you are in doubt as to which size you should knit, you can just measure the babies foot! It is also worth noting that with some patterns, you vary the size of the booties by changing the size of the needles you use for your knitting. For example, if you have a bootie pattern you particularly like but it is not the right size, you can make the booties smaller by knitting with smaller needles than the ones specified in the pattern (i.e., using 2.75mm needles instead of 3.25mm). And if you need to make them bigger, just substitute larger needles. The amount of knitting is exactly the same, but the change in tension resulting from the different needle sizes means that the booties are smaller or larger depending on which set of needles you have used. Other patterns vary the size of the booties by varying the ply that is used. For example, newborn booties may be knitted with 2 ply, booties for 3-month-olds might be knitted in 3 ply and the larger booties suitable for a six-month-old would be knitted with 4 ply yarn. My advice is to read your pattern carefully before you start and if you are still new to knitting (or if you are a bit nervious and want your baby booties to be perfect) use the materials and needles specified in the pattern and follow the instructions exactly. Basically, there are two different types of patterns for baby booties. With one type, the bootie is knitted from the top to the bottom, and the other starts at the bottom and knits up. With the first type, you will need to shape the heel of the bootie much like you would with a knitted sock. With the second you shape the instep instead. If you are a beginner, you might like to start out with a pattern with no shaping instead. But if you want a more traditional looking bootie, I strongly recommend that you find one of the second types of patterns, shaping the instep is much easier than shaping a heel! I usually knit my booties on a pair of circular needle so that they are seamless (most of my more advanced patterns are seamless and probably not suitable for beginners) but most basic patterns for baby booties are knitted flat on single pointed needles with a seam along the sole and up the back of the bootie. I tend to use the same basic pattern for knitting booties, varying the knitting stitch patterns that I use for the base, top or instep of the bootees. No two pairs are ever the same, as I am not a big fan of doing the same pattern twice! 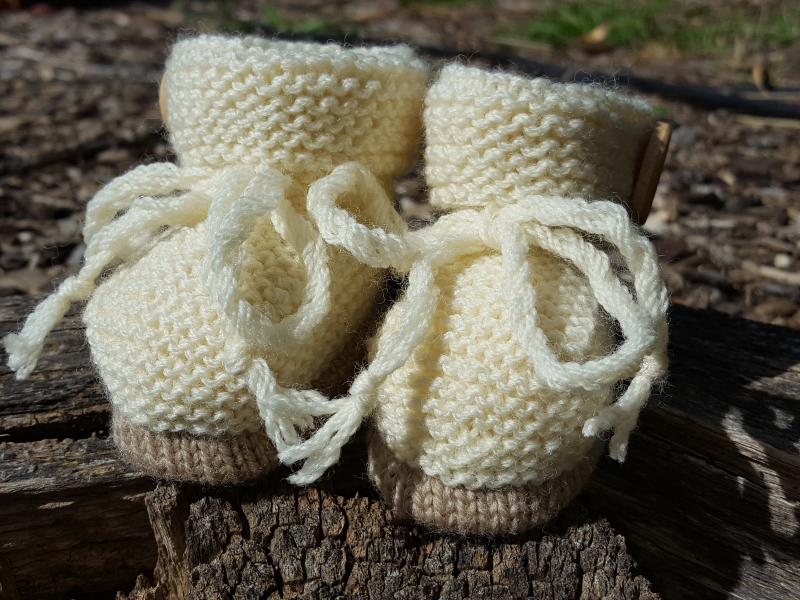 If you would like a copy of the pattern and to see some examples of what you can do to change or modify it to create unique booties for the baby in your life, it might be worth stopping by this page. Once you settle on a pattern that you like for knitting booties, and understand how the elements all fit together you can exercise your creativity to customise or change the pattern to make each pair of your booties unique. 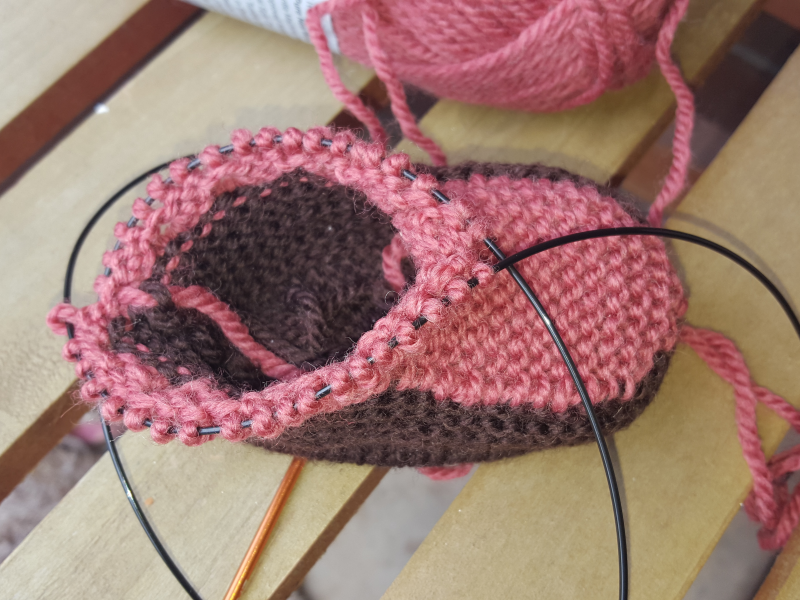 If you are new to knitting, doing the shaping required for traditional baby booties may be a bit difficult to start with. So I have developed a couple of really simple patterns for booties done in garter stitch with very little or no shaping at all. Just click through to my how to knit baby booties page for more information on how you can make some.